I had never visited Stornoway, the main town on the Western Isles of Scotland and capital of the Isles of Lewis and Harris before meeting Lauren, but it has now become somewhere I travel to each year and a town that I’ve become very fond of. And although now a frequent visitor, I am still very much a tourist on these islands, discovering something new on each trip but from one tourist to another (with help from Lauren), this is our guide and some of our recommendations for things to do in Stornoway. 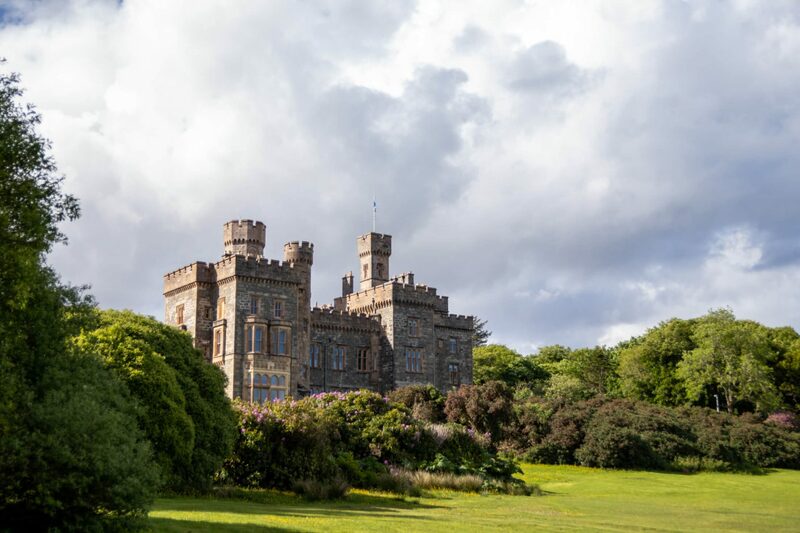 Overlooking the entire town and probably one of the first things that you’ll spot when coming into Stornoway Harbour on the ferry from Ullapool or by one of the many Hebridean cruises that visit the islands during summer, is Lews Castle. Once a building that someone called home, Lews Castle is now a luxury hotel by Natural Retreats. The castle itself is open daily to visitors and also features a Starbucks, The Storehouse cafe, whisky bar and Outfitters shop inside. Lews Castle is family friendly and there are often activities held in the castle for children, inclusive of Sundays when the island is otherwise mostly closed, so be sure to check when visiting if there’s anything happening during your trip. Outside the castle, you’ll find sprawling grounds that are ideal for taking a stroll. 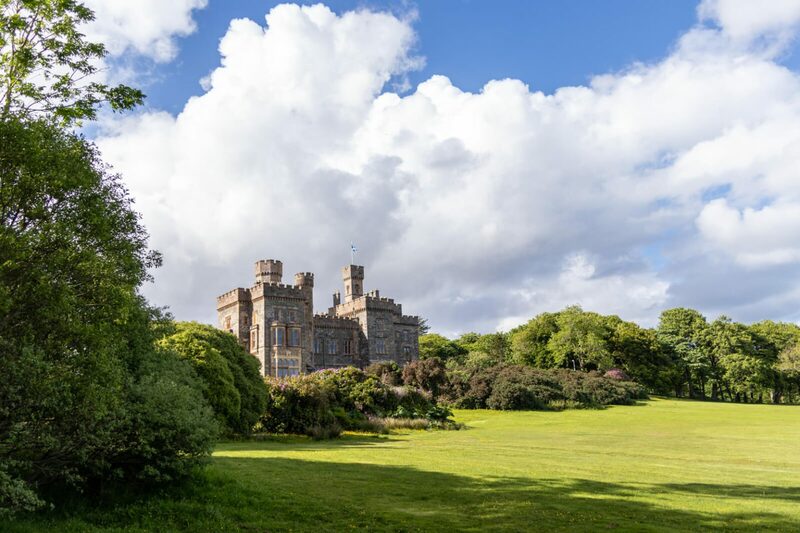 While the rest of the town shuts down to observe the Sabbath, Lews castle grounds become an extremely popular destination for visitors and locals alike. You’ll find many people taking their dogs on woodland walks around the vast 270 hectares of trails and pathways that follow the River Creed as it winds its way down towards the mouth of the harbour. Listen for the sound of herons and if lucky, you will also spot seals in the waters. If mountain biking is your thing then you will find a number of trails through the woodland. It’s worth keeping your wits about you if you’re walking, just in case you end up on a cycle track as they can appear from nowhere. However, I remember my granny telling me stories years ago of Mac an t-Srònaich (the local bogeyman), and how he used to hide in the Castle Grounds. I still don’t like to be too close to the grounds come darkness. Just in case. 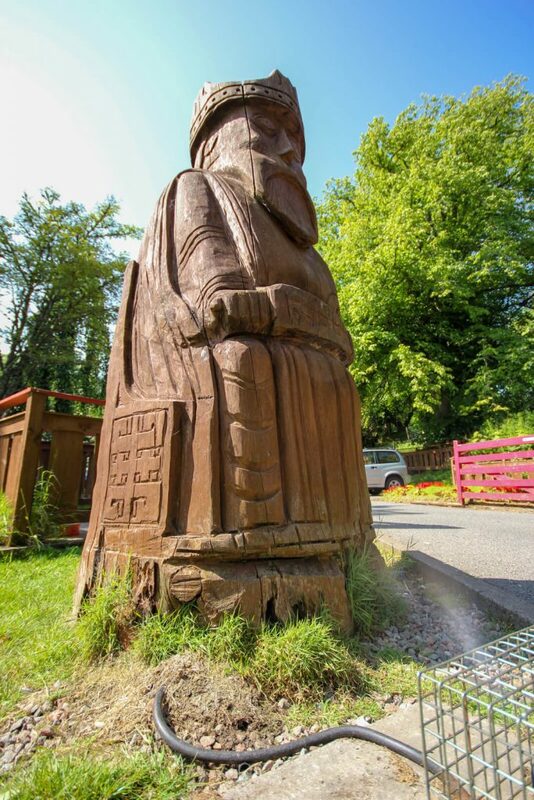 The castle grounds are also home to the popular Hebcelt Festival during the summer. Which leads us on to the next thing to do. This may be the reason that you’re visiting the islands, but if not and you’re planning your visit during the last few weekends in July, you’ll find the island a lot busier than usual. Hebcelt is an annual Celtic music festival that takes place on the castle grounds, bringing thousands of visitors to the islands every year. The festival is a mixture of folk, rock and Celtic music and some of the main headliners from years past include Runrig, The Proclaimers, Van Morrison, The Saw Doctors, Idlewild and more. To coincide with the festival you will find a lot of activities happening in the town such as markets, street performers, competitions and a general buzz of excitement around Stornoway. Hebcelt tickets can sell out far in advance of the festival and considering the population of Stornoway is only around 8000 people, local establishments, hostels and caravan parks (Laxdale Holiday Park is one of the most popular during Hebcelt) which can accommodate visitors, quickly fill up. There are several fields which allow camping but again, make sure to book as early as possible to ensure a space. Another music festival you may have the honour of experiencing is the Royal National Mòd. This is a festival celebrating Scottish Gaelic poetry, music, song, arts and culture. Scottish Gaelic is prominent within the Islands and you will hear it spoken often, but you will also see this throughout the town on the street signs, where Gaelic is featured above the English. A modern extension built to the back of Lews Castle holds the Islands museum which, is funded by Western Isles Council (Comhairle nan Eilean Siar) among others. The museum offers an interactive insight into the culture, history and diversity of life for those living on the Islands, from prehistory to present day. The museum also features artefacts from history, some of the infamous Lewis chessmen, to more the current Nike and Vivienne Westwood tweed collaborations. The museum is closed on Thursdays and Sundays. Entry is free. This Scottish Baronial Tower, which reaches heights of over 85 feet, on top of an already 300-foot high hill gives you some of the best views over the town of Stornoway. Despite the views, this is not to forget that this memorial in remembrance of those that were lost during the war and Iolaire disaster. A short distance from the town of Stornoway is the Iolaire Memorial to remember those lost on the Islands, and one of the UK’s, greatest maritime disasters. Having just passed the centenary of this disaster, you may see frequent mention of reference to it throughout the town. On the fateful night of January first 1919, shortly after the New Year Bells, the H.M.Y Iolaire struck the infamous rocks, the ‘beasts of Holm’ while taking many sailors back to their loved ones following the end of WWI. 205 men were lost, many families and villages lost their men and this sorrow is still felt to this day. I would consider this the most prominent building in the centre of Stornoway and it was always my favourite, having more ornate detail, turrets and clock tower. I fondly remember the days that An Lanntair was within these walls but it is now mainly used as a venue and for private functions. You will find craft fairs, markets, music shows and weddings being held in Stornoway town hall. A mini Harris Tweed visitor centre has also been opened within Stornoway Town Hall in which visitors can join in on an audio and visual presentation into the history of Harris tweed and see the looms at work. 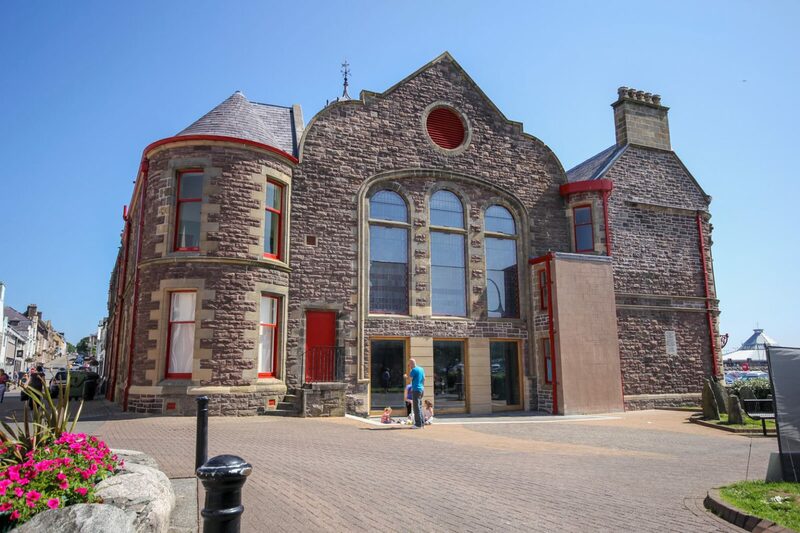 An Lanntair (The Lantern in Scottish Gaelic) is a cinema, art gallery, cafe, gift shop, multi-arts centre in Stornoway. I would consider An Lanntair as one of the main hubs in Stornoway among tourists and locals. One question I am often hesitantly asked is ‘what shops are in Stornoway?’, and while the island may feel in the back and beyond, rest assured that there is still ample shopping opportunity. While many of the locals (myself included) are still missing popular shops such as Woolworths, and more recently Murdo Macleans (the only department store in town) there have been signs of regeneration when it comes to shopping in Stornoway. For those coming from the mainland, there will be some familiar names such as Boots, Superdrug and Argos. These stores may not be as widely stocked as those on the mainland, but I do find that the Superdrug in Stornoway offer a lot of options that I struggle to find elsewhere. There are many shops in Stornoway but one area that I find limited is clothes shopping, especially for the younger generations, however, there are options with Peacocks (to be found in The Co-op), Influence, M&Co and Underground for men. Delights – This is a lovely homeware and gift store who also sell some artisanal foods. There is a small cafe within the store but tables are limited. The Blue Lobster – I love the homeware at The Blue Lobster. They have a very blogger/Etsy aesthetic, and if you are a blogger, or read blogs, you will know what I mean by that. Bethesda Hospice Charity Shop – My favourite shop in Stornoway. If you appreciate mid-century modern furniture as I do, you will find it here in droves. And at a spectacularly low cost to boot. Aladdin’s Cave – There are no limits to what is sold in Aladdin’s Cave and I wouldn’t know where to begin in describing it. From the mundane to the truly bizarre, it’s a shop you have to see to believe. 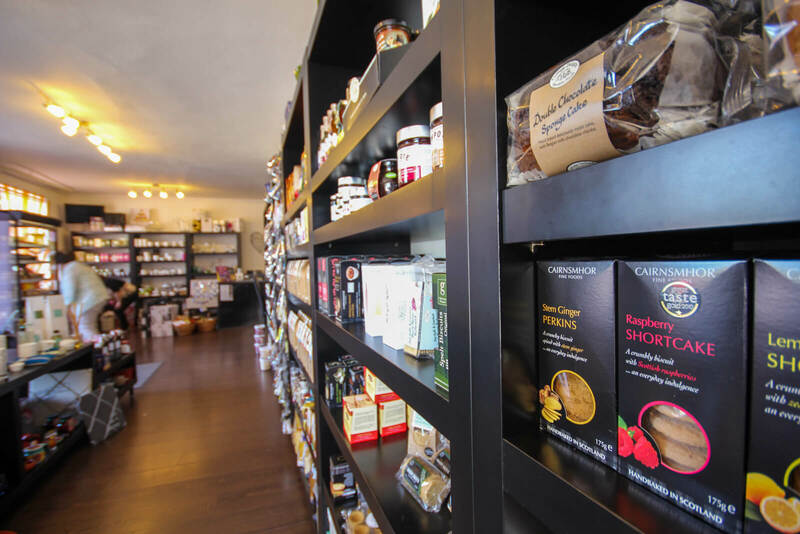 The Good Food Boutique – The local deli where you can buy all your cheeses, meats, olives, bottles of vinegar and oils. They also sell packaged teas and foods which make lovely gifts. Influence – A long-standing shop in Stornoway, Influence sell womenswear and some homeware among others. The Baltic Bookshop – The local bookshop, which is across from the library. I would consider The Baltic Bookshop a mix between newsagents and bookshop. Here, you can pick up cards, pens, papers, sweets along with a selection of books and trinkets. Be sure to head up to the back to the dictionary to see what the “word of the day” is. K J Macdonald (Kenny Froggans) – Primarily a pharmacy, you will also find a selection of beauty, perfumes, homeware, children’s goods and some of my favourite locally made Sandwick Bay Candles, among others. Sportsworld – Sportsworld sell some clothing and shoes, sports and fishing equipment. An Lanntair – The best stockist of Rifle Paper Co products that I have come across in Scotland. They also sell a lot of locally made items and are a great store for gifts. Lewis Loom Centre and Harris Tweed Hebrides – You will come across many tweed shops in The Outer Hebrides and we are proud of the heritage and hard work that goes into making it. Whether you are looking to buy tweed cloth itself, or some already made products, there is no short supply when it comes to shopping but make sure to look out for that all important Orb from the Harris Tweed Authority for authenticity. VisitScotland iCentre – Head here for maps, postcards and tourist information. Black Pudding – Black pudding (Marag dubh in Scottish Gaelic) is a bit of an institution in Stornoway and often heralded as the best in the world. Three of the most popular are as follows, Charley Barley, MacLeod and MacLeod and Willie John – If you have tried Stornoway black pudding, let us know which you think is best! There are 3 supermarket options available in Stornoway; The Co-op, Tesco and Iceland. I would consider The Co-op to be the largest supermarket in Stornoway although not often the most competitive in price. Tesco is most easily accessible to those travelling to Stornoway by ferry as it is directly opposite when departing the ferry car park. Tesco is a popular option and this store can be very busy. Lastly, you can find Iceland on Cromwell Street in the town centre. Iceland is the only supermarket in Stornoway without designated parking but there is a pay and display car park in Perceval Square just across the road. Wherever it is you choose to shop, make sure to add some locally made Stag Bakery products to your basket! Notably, their morning rolls which are our absolute favourite. They may be more expensive than your branded names, but they are worth it. There are two main car parks (although there are others) that you will find used in Stornoway. Perceval Square car park – There is a very small fee when using this car park, you will also find local markets in Perceval Square. South Beach Car Park – By the harbour, this is the largest car park and is free. Gordons – If you can make your way out to Back, approx 8 miles out of Stornoway town centre, the petrol cost is significantly less. 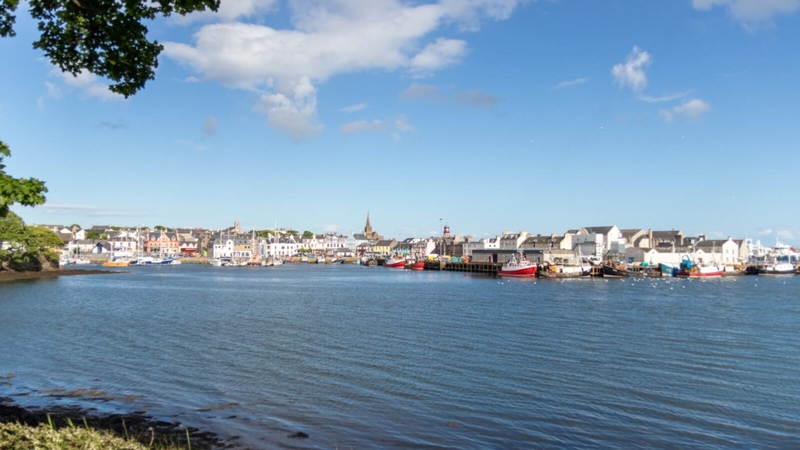 Below, we have written brief descriptions of the most popular, and some of our favourite restaurants and cafes in Stornoway. The majority of eateries in Stornoway are family and mobility friendly, although not often pet-friendly, with some being more so due to space. Digby Chick – Digby Chick is popular among locals when booking a celebratory dinner or night out. As a lot of local produce is used, fish features heavily on the menu but other options are available. Although not formal, this is most likely somewhere you would get a little dressed up for. Kopi Java – Kopi Java is our personal favourite cafe in Stornoway. A family run business and while the decor may not look like much, they offer simple foods, done well. A good strong coffee along with really lovely homemade cakes and sandwiches. HS-1 Cafe Bar – A long-standing and family friendly cafe bar in Stornoway. Open early till late, they offer coffees, light lunches and evening meals along with drinks and cocktails. While the food at HS-1 is quite nice, I do not rate the service. In my experience over recent years, you can often be left sitting for quite some time unnoticed which we don’t like, equally, this is somewhere that a lot of locals like to while away the time so it really depends on your take of it. Woodlands Centre – Set in the castle grounds and another popular music venue location. The Woodlands Centre sell light meals along with coffees and cakes. Eleven – Part of the Caladh Inn, Eleven is a carvery and buffet offering a variety of cuisines. Great for larger groups, good value for money and I have always enjoyed our visits there. 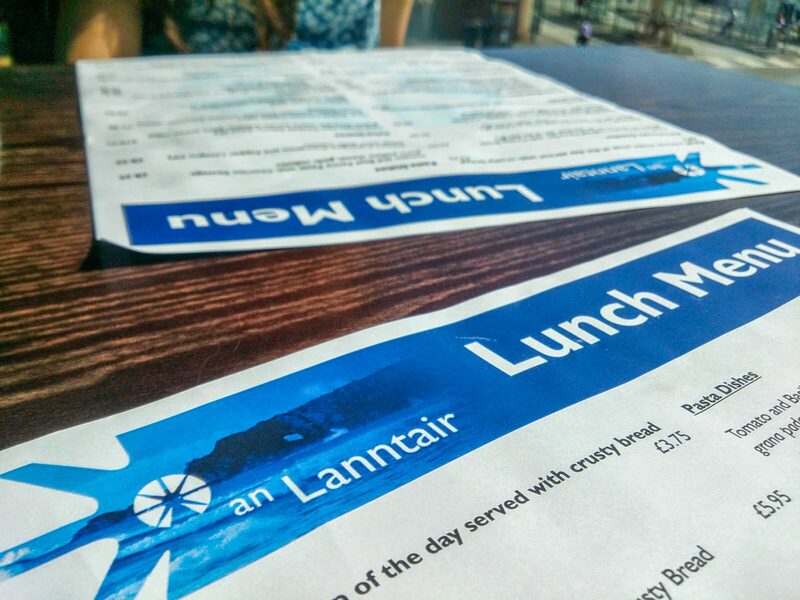 An Lanntair Café Bar – Part of the multi-arts venue in Stornoway and a popular meetup destination among tourists and locals. Again, much like HS-1, the option of breakfasts, light lunches, meals, coffee, cake and alcoholic drinks are available. While I am not a fan of their coffees, they do a great bowl of sea salt and paprika chips. Some of the tables offer wonderful views over the harbour, especially if you are lucky to visit on a bright day. The Blue Lobster – This is a lovely homeware store as I mentioned above but they do also have a small cafe for coffee and cake. I consider this to be more of a grab and go premises, there is some seating outside should the weather be kind, otherwise, there is a small area of window seating inside. My lovely grampa wasn’t too taken with the high seating, something I wouldn’t have given a second thought, but is maybe something to note. Visitors are asked to make use of the (very) nearby public toilets. Camerons Chip Shop – Head into this popular chip shop for some ‘cheeky chips’ a half portion of chips and sausage – A favourite of mine growing up and still something I enjoy now. The Thai Cafe – We love Thai food so we couldn’t miss this one from the list. A BYOB family run restaurant in the town centre. Artizan – Artizan is primarily a coffee house with lighter meals, but also sell artwork and gifts. Another favoured location among locals and tourists and more often than not, very busy, which is a testament as to their popularity. The Storehouse Café – Located in Lews Castle, you will find the family-friendly Storehouse Café along with Starbucks. The menu is good, from pancakes and waffles to burgers and quiches and afternoon teas, however, the service, including at Starbucks is very, very slow. The Isle of Lewis Sports Centre is a dual sports complex with use by the Nicolson Institute school but is also available for use by the public. The Sports Centre offer a variety of facilities including; climbing wall, swimming pool (separate pool for younger children), squash courts, running track, astroturf and fitness centre and health suite. There is also a cafe in which parents can sit whilst watching either the pool or climbing wall. Adventure Island Softplay – A multi-level soft play area for children which includes a cafe. 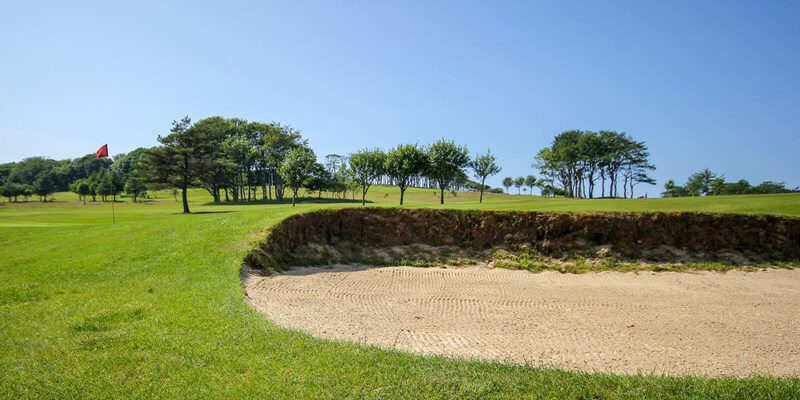 Bayhead Playpark – Just along from the castle grounds and town centre, offers a wide variety of activities and fun for the family such as; Playpark, Skatepark, Tennis Courts, Rugby Club, Bowls and Crazy Golf. Beaches – Of course, one of the things that The Outer Hebrides are best known for, are the beautiful and tropical looking beaches and luckily, when on an island, you don’t have to travel far to find one. Please see our post on the best things to do on the Isle of Lewis linked below for more information on some of our favourite beaches. 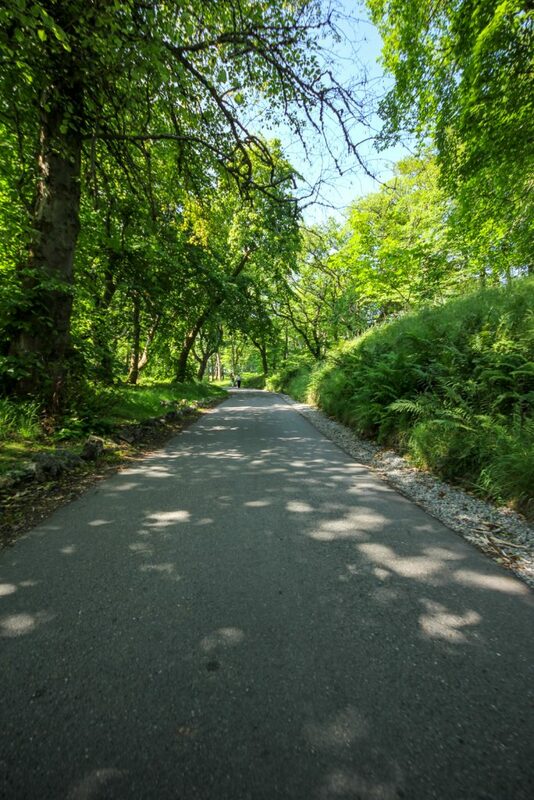 Segway Hebrides – Segway Hebrides offer tours around the castle grounds for groups of up to 5. It may not be everything, but hopefully, this post will help provide you with a starting guide to Stornoway. Check out our post for hidden gems in The Outer Hebrides when doing the Hebridean Way and our post of some of the best things to do on the Isle of Lewis including the infamous Callanish standing stones.